Bad Blood: The Movie is the feature film directorial debut of Atlanta native Tim Reis, who has previously directed music videos. The horror film explores the largely uncharted werefrog. “It’s like a werewolf, but a frog.” Tim Reis once explained. Tim wrote, directed and edited the film, which he mostly shot at his parents house. Bad Blood follows what happens to college student Victoria Miller after she returns home to her mother, stepfather and stepbrother under some mysterious circumstances. The relationship between Victoria and her family is strained at best. She borrows her stepdad’s car without permission to meet some friends for a party. On their way to the party, Victoria and her friend encounter a creature that ruins their night and the foreseeable future. At the first encounter with the werefrog, like any horror film, the movie takes a turn for the ridiculous. Bad Blood: The Movie is not a bad movie, but it isn’t that great either. The film is bloody, but not scary, and mostly laughable. The ex-cop turned private eye, is possibly the best worst character ever created; his angry daydream sequences are a bit non-sequitur, but delightful. The pacing in the film is a bit slow, especially during the first half of the film; but the thing to note is that this is the director’s cut, and director’s cuts are almost always a little longer. There are some times when the sound effects seem a little extra. The other technical aspects of the film are better than the average indie horror flick. The acting in the film is feels semi-professional, a few times being over the top and other times being on the cusp of really good. Bad Blood: The Movie feels like the perfect film to play in the background of a Halloween party or any other event where a horror film feels appropriate. 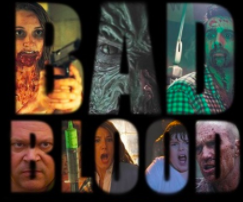 Bad Blood: The Movie is now available on Amazon Instant Video and itunes. The film is a decent 3/5 stars.